Create a user account (like WhatsApp). Whenever there is a new contact entry, if the contact is using my app, then immediately in the Contacts application show options "call" or "message" in the contact detail page. You need to create a SyncAdapter, this is basically a service that is able to sync contacts to/from a server, like Google does for Google Contacts, you can set it to be notified when a new contact is added, and have your SyncAdapter add the needed info to the contact so it'll show links to your app. If you go to your phone settings > accounts, you can see Whatsapp and Google's SyncAdapters there, where you can turn them off/on. To create a sync adapter, you can follow the official docs, or this great tutorial. Not the answer you're looking for? Browse other questions tagged android android-contacts android-syncadapter android-account android-contact-mimetype or ask your own question. How to provide whatsapp like functionality inside contacts apps? How to get app icon in android contact details like whatsapp ? How to add intent to open my app in contact list? How do I get my custom account type to show up in the android contacts app? 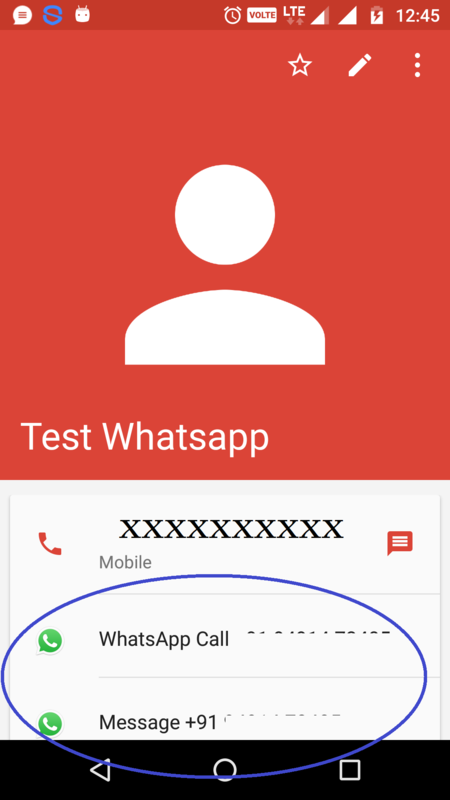 How to add custom app tag in native android contact app? How does apps like whatsapp show contacts that are only using the app?